A rarely used term for periorbital hyperpigmentation caused by primary biliary cirrhosis; it is not used in the working medical parlance. 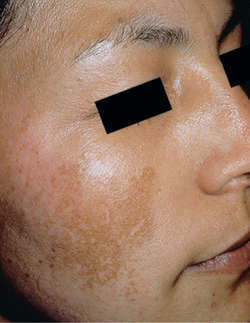 Brownish pigmentation of the face, often occurring in pregnancy. It usually disappears after delivery. It is also seen in some women who take progestational oral contraceptives. Chloasma caused by external agents such as sun, heat, mechanical means, and x-rays.